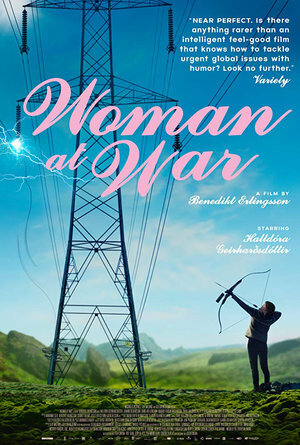 In Women at War, an angry, jolting joy of a movie, an Icelandic woman turns the nation upside with her solo crusade of ecological sabotage. How does the most celebrated and despised criminal on a small and insular island where everybody seems to be related to each other keep escape from the law? 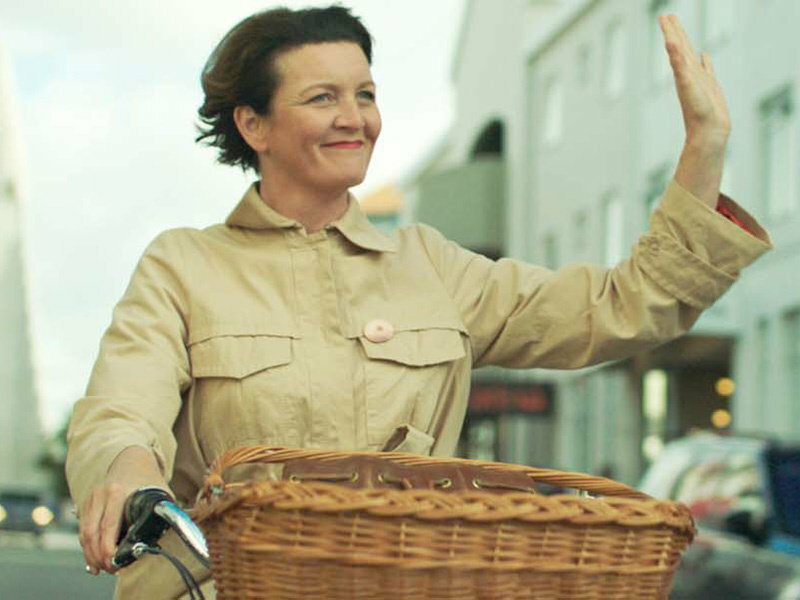 The way that the eco-saboteur Halla (Halldora Geirharosdottir) manages it in Benedikt Erlingsson's sharp stunner of a comedy Woman at War (Kona fer í stríð), is with a lot of luck, pluck, and a good amount of dramatic license. This is a movie where the line between real and unreal is as porous as a Greek comedy, so a little bit of tweaking from Erlingsson and his co-writer Olafur Egilsson isn't unwelcome if it gives the heroine some more time on the loose. The first time we see Halla, she's already been radicalized. A choir director in her everyday life, she has of late become incensed by modern industry. What the island's small, smug ruling clique would call progress, she sees as "crimes against humanity". When the movie opens, she's out in the great wide green Icelandic mountainscape, firing an arrow tied to a cable over some power lines. Sparks erupt, and miles away a massive smelter shuts down. Back in her tasteful little Reykjavik apartment, Baldvin (Jorundur Ragnarsson)—an antsy bureaucrat serving as her inside man in the government—tells her that last little action could cause a massive mining conglomerate and other companies to leave the island. His look of panic only seems to fuel her fiery joy. Woman at War is an unlikely story about an unlikely rebel that nevertheless presents everything we see with a tone of icy sharp realism, which only brings into sharper relief the dry comedy and unalloyed idealism underlying it all. Erlingsson shows no tonal disconnect in portraying Halla as both noble warrior and somewhat baffled dreamer. In one moment, she's racing across the epic landscape to escape from the law, hugging the lichen-covered earth like it's a long-lost family member, or taking down a drone with an arrow whose trajectory Legolas would have approved of. In the next, she's floored by the news that her long-delayed request for adoption has finally come through and she's trying to get her hippieish twin sister Asa (also Geirharosdottir) to act as a backup caregiver like a scene from some self-impressed urbane sitcom. All the while, Erlingsson injects a sense of carnival-esque chaos. He breaks the fourth wall in a low-key manner by planting the three-piece band (tuba, piano, drums) pumping out David Por Jonsson's bouncy, martial score in the scenes themselves—Halla looking directly at them at least once as though asking for advice. A somewhat hapless Latin American backpacker (Juan Camillo Roman Estrada, playing a character with the same name he had in Erlingsson's 2013 movie Of Horses and Men) keeps wandering through and getting arrested instead of Halla, whose being essentially a very long setup to a third-act joke becomes almost a joke in itself. On a couple occasions, Halla is saved from arrest by a grumpy rancher (Johann Sigurdarson) who turns out to be a maybe-cousin of hers (not uncommon in a place like Iceland). Nevertheless, there's an undeniable force to the intensity of Halla's uncompromising anger. In many other guises, her transition to monkeywrenching acts of defiance—which include hurling her manifesto calling to "stop the war against our Earth" signed by "The Mountain Woman"—just as she is about to become a mother would seem vainglorious at best and bound for catastrophe at worst. But by placing Halla's flinty moralism against this jaunty music and deadpan Nordic comedy somehow gives it a certain gravitas. Each joke carries a punch. In one scene, she evades a police camera by wearing a facemask made from a picture of Nelson Mandela. That an eco-warrior archer would take on this guise seems an at first an odd fit or a visual gag. But then you remember, Mandela might be remembered now as mainly an icon of moral patience for his reconciliation work. But before being jailed, he was a guerrilla fighter, too.